NETWORK FINALS: TO TELL THE TRUTH fell 0.1 in final numbers. 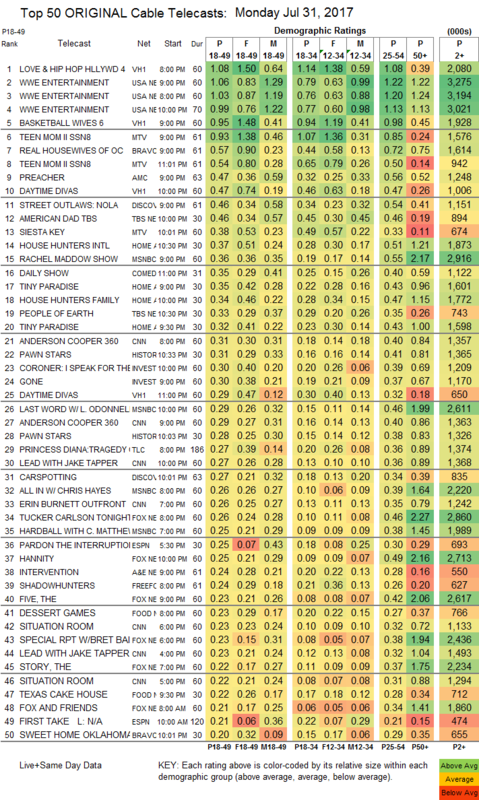 CABLE HIGHLIGHTS: It was a close race for the Monday cable lead, but VH1’s LOVE & HIP-HOP prevailed despite a one-tenth drop to 1.08, with lead-out BASKETBALL WIVES down 0.04 to 0.95, and DAYTIME DIVAS up a tick to 0.47, plus another 11PM episode at 0.29. USA’s WWE telecast was at 1.06/1.03/0.99, compared to last week’s 1.06/1.02/0.95. On MTV, TEEN MOM jumped 0.18 to 0.93, with an AFTER-SHOW at 0.54, and hammocked between them the premiere of SIESTA KEY at 0.38. Bravo’s REAL HOUSEWIVES OF ORANGE COUNTY ticked down to 0.57, and SWEET HOME OKLAHOMA ticked down to 0.20. 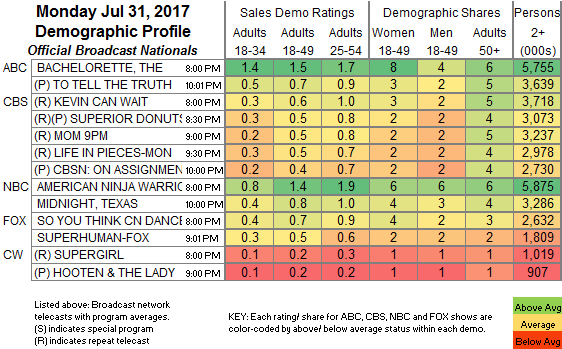 On AMC, PREACHER rose 0.03 to 0.47, and LOADED was up 0.04 to 0.12. Discovery’s STREET OUTLAWS returned at 0.46, followed by the premiere of CARSPOTTING at 0.27. On TBS, AMERICAN DAD ticked down to 0.46, and PEOPLE OF EARTH was up 0.03 to 0.33. On HGTV, HOUSE HUNTERS INTL ticked up to 0.37, HOUSE HUNTERS FAMILY was at 0.34, and TINY PARADISE was at 0.35/0.32 compared to last week’s 0.26/0.26. MSNBC’s RACHEL MADDOW SHOW once again topped cable news at 0.36/2.9M, above CNN’s ANDERSON COOPER 360 at 0.31/1.4M and Fox News’s TUCKER CARLSON TONIGHT at 0.26/2.9M. History’s PAWN STARS was at 0.31/0.29, compared to last week’s 0.37/0.33. On ID, CORONER ticked up to 0.30, and GONE was up 0.07 to 0.30. TLC’s PRINCESS DIANA special was at 0.27. A&E’s INTERVENTION was at 0.24, and DOPE MAN premiered at 0.19. On Freeform, SHADOWHUNTERS was steady at 0.24, and STITCHERS ticked up to 0.13. On Food Network, DESSERT GAMES rose 0.03 to 0.23, and TEXAS CAKE HOUSE was at 0.22/0.18, above last week’s 0.16/0.16. TNT’s WILL was steady at 0.10. Lifetime’s busted pilot A MIDSUMMER’S NIGHTMARE aired at 0.08.